Offer your knowledge and time to benefit the future workforce. Call 0330 124 4446 to attend a careers fair, hold a work placement day, take on apprentice and more! You could find your next recruit waiting for you in Bristol! Mechanics, chefs and business women, alongside doctors, builders and even a scientist, will be lining the streets of Bristol from Wednesday 19th September, hoping to be snapped up quickly by a new employer. What is the 'Find Your New Recruit' campaign? 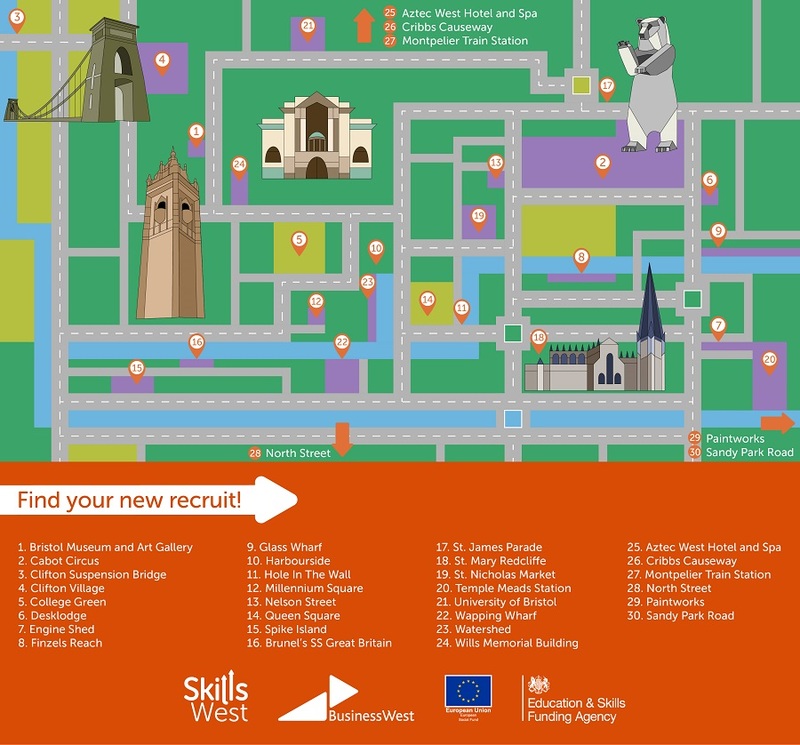 The ‘Find Your New Recruit’ campaign is being run by Skills West, a project delivered by Business West, to raise awareness of the skills gap affecting Bristol and surrounding West of England regions, whilst encouraging employers to think about how they can support the future workforce. "It's a bit of fun to highlight a serious issue,” explains Nicky Williams, Head of Skills West. “We’re currently experiencing the lowest unemployment rate since 1975 which, whilst great in one way, intensifies the problems local businesses are having when it comes to finding skilled people to join their team. The campaign aims to emphasise this point and let businesses know how they can work with us to help ensure workers have the relevant skills they need in the future." The campaign aims to emphasise the skills gap in the West of England and let businesses know how they can work with Skills West to help ensure workers have the relevant skills they need in the future. The Skills West team will be placing LEGO® men and women, in various professions, around the city for people to find. Once found, the public will be encouraged to take a selfie with their ‘new recruit’ at their place of work and tweet Business West (@bw_businesswest) with the hashtag #pledgeyoursupport. Every selfie will be entered into a prize draw to win an experience day where you can learn a new skill – your choice from a flying lesson, cookery lesson or photography course. Every selfie will be entered into a prize draw to win an experience day where you can learn a new skill – your choice from a flying lesson, cookery lesson or photography course. Where will the LEGO® figures be? The LEGO® figures will be placed in areas around Bristol with heavy footfall, such as Millennium Square, Bristol University, Brunel's SS Great Britain and Cribbs Causeway. How long will they be around the city? What's the reason for the campaign? #Pledgeyoursupport refers to the Pledge campaign by Skills West to encourage organisations to offer their knowledge and time to benefit the future workforce. It's easy and there are many ways to get involved, from speaking at a careers fair to holding a work placement day. Taking part will allow you to contribute to reducing the region's skills gap and help your organisation with its own skills needs. Please note - LEGO® is a trademark of the LEGO Group of companies which does not sponsor, authorize or endorse this campaign.